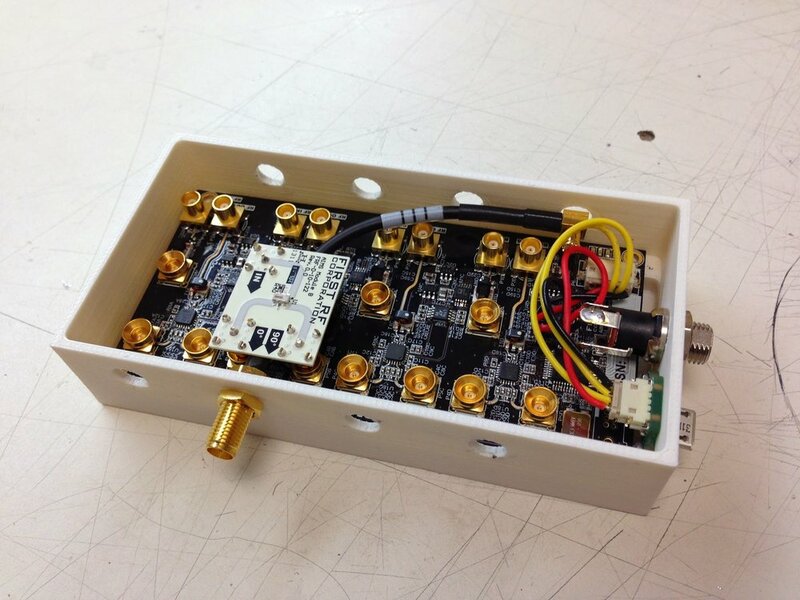 Often the source of RF problems are not from the RF design itself (but sometimes they are). Similar for EMI/EMC. For example, often the problem with receive sensitivity on radios are spurs from PCI-E, RAM, network PHYs, and switch-mode power converters. We list these, as at Luxonis we’ve debugged and resolved such spurs. In fact each of these, was the culprit on separate designs. And we’ve mitigated them with varieties of different techniques. A quick summary is below, and if you’re more interested in RF Design than RF fixing, scroll all the way to the bottom to see some of those projects. Improper board layout (from the incumbent design), resulted in in-board/in-layer radiation from the processor-radio interface directly to the antenna, in-band, resulted in receive-sensitivity degradation of 15-20dB. To demonstrate how bad that is, keep in mind that every 3dB of lost receive sensitivity means you would need an antenna that is 2x bigger to make up for it. So 20dB of lost receive sensitivity means 2^6 = 64x. So the antenna would have to be 64-times its size to make up for this, or in other words, other products could be 1/64th the size would have comparable performance! And this was in a shipping-in-the-thousands radio system. Re-laying out the board to prevent this (albeit quite-nuanced) problem brought this design back to ideal/theoretical limits based on the RF architecture (and resulted in many happy customers). The resolution for this varied across product lines. Most of the products had sufficient space to move the RAM to the opposite side of the board (which already was being populated), to use the board itself as shield, so for these it was a zero-cost improvement. For those where space was too tight to afford this, the addition of an inexpensive RF can over the RAM, equally solved the self-interference. This one is short-and-sweet. In one permutation of a product, which had the same exact integrated circuits as a slew of other, very-similar (even in form-factor) products, there was severely-degraded S-band performance. As is our initial go-to (which you’ll see more of later-on), we grabbed near-field probes, a low-noise-amplifier (LNA; which is important to overcome the often 20-30dB noise figures on the front-ends of most spectrum analyzers) and took a look at the emissions. What did we find? There seemed to be spurious emissions, in the S-band channels of interest, coming from the network PHY. Specifically, the heatsink on the PHY was resonating with the harmonics the PHY was generating. On the other variants of the products, the heatsink was sufficiently far away (often on the other side of the board) from the antenna that the emissions just didn’t matter. On this one product (which had an enlarged, improved-sensitivity antenna), the heat-sink had direct line of site to the antenna, and happened to couple much stronger to it (perhaps even co-resonating). The heat-sink dimensions were changed slightly to push these otherwise non-harmful emissions (non-harmful because their level was too low to impact anything else) slightly out of band. And eventually the heatsink itself was eliminated, replaced with direct connection of the PHY to the enclosure for heat-sinking. We want to highlight the following story in particular depth as it was standing in the way of a $10 million contract for the startup we helped, and had very interesting requirements. The product is a wireless-charging iPhone case, the year is 2009 (so long before wireless charging was popular for phones), and the startup had won a tentative contract with a very-household-name company (not to be listed here) to produce these in huge volume, pending Apple WiF and cell interoperability official certification. The problem is that the product is failing the tests by huge margins. The Apple requirement (at the time, we don’t know how/if they’ve changed since) were such that the accessory (the wireless charger, in this case) could not reduce both WiFi and cell link margin by over 3dB, in any band, at any angle (tested at 5-degree az/el, full-sphere). So as above, the wireless power circuit was raising the noise floor, at the back of the iPhone, by around 10dB, and up to 20dB in some bands. Making this worse, the placement of the circuitry on the case (see below) put it right over the RF circuitry in the phone (RF, IF, and baseband, in fact). Wireless-charging phone case interfering with cell (3G, in this case) receive sensitivity. And leveraging a tear-down of the iPhone 3GS (remember, this is from 2009) reveals that the radio circuitry is directly below this placement of the charger. So, the spurious emissions were likely directly coupling into this circuitry; the placement is so close that it doesn’t even have to be radiative, evanescent magnetic field coupling is near full-strength/high-efficiency, since the charger is literally pressed against the back of the phone. That is to say, the noise shown on the spectrum analyzer is likely efficiently making it into the phones very-sensitive RF circuitry. The case design was fully locked down, tooling finalized, and inventory of around 50,000 units, and growing, was already in a local warehouse. The startup would fold if either of these had to be changed. This means, among other things, that the location of the wireless charging circuit cannot be moved about, as this would mean halting producing, changing (or scrapping) the tooling, and scrapping the 50k units build up in inventory. This also mean that, if at all possible, the PCB needs to remain the same, as if redesigning it is the solution, the 50k finished units would need to be scrapped, with additional PCB inventory also scrapped. Seems like an impossible situation? That’s what we thought… And the first meeting with the client did involve a lot of ‘wait, what?’, but we decided to see how we could help nonetheless. A sticker. And it passed Apple certification, first try! The best part was that a sticker, of the exact dimensions was already in the product, on the inside of the case for describing its FCC certifications/etc. . So the change in the design was just that: a metal sticker instead of a plastic one. And, fortunately, the existing units were easy to retrofit. We even helped the staff over the weekend where all 50k units were retrofitted from plastic stickers to metal ones. The metal sticker was more expensive than the plastic one, but it turns out the cost was fairly negligible, and we ended up additional testing and certifying a variety of sticker types, which afforded a variety of choices in terms of material and vendor, which helped with long-term pricing. This one is also interesting as it’s a bit surprising. Another client approached us for EMI mitigation for their infrared tactical lighting solution (and also for making their product compatible with the operating voltage specifications of military vehicles, but that portion of the work is in the Power Electronics section). They had a popular lighting line for police/fire-fighter, which had also found a strong following among automotive repair professionals. Their core competency was thermal-feedback lighting design (which was novel at the time, and now is seemingly standard-practice), which allowed their LED products to deliver more light, for longer, by running each LED at its optimal thermal point. This system also resulted in much longer product life. Given their success in similar markets, and their capability to produce (a) longer-life LED products (at the time LED lights suffered greatly from longevity issues, mainly because of a lack of such a thermal management system) and (b) much more light than competitors in either the same package or same power, an expansion in to tactical/military lighting made sense. They successfully made their first design, and the military loved it for its form-factor, brightness, and robustness in their testing (except for transient handling, see our fix in Power Electronics). They then initiated the process of outfitting it into their fleet of land vehicles, going from the larger, lower-brightness, more expensive, and more problematic incumbent unit. Before any outfitting could occur though, EMC/EMI testing needed to be verified on each representative land vehicle, which is where we ended up getting involved. It turns out that the light itself was emitting in ways that interfered with the sensitive on-board communication. To put this in perspective, so as to not insult the existing design (because it wasn’t bad), the wiper manufacturer had to completely re-do their design, around the same time, as their new design actually interfered worse. As above, we started with near-field probes to see how the emissions are being generated, where they may be resonating, and how they’re leaving the metal enclosure. The high-frequency emitters were on the front of the board, where they were not encased in the Faraday-cage of the metal enclosure, but instead only behind the plastic lenses and glass cover. There was insufficient filtering on the input power, so conducted current waveforms from the switching converter were present on the internal wiring on the product’s frame, which were directly radiating and also resonating with the frame and re-radiating. To verify issue 1 was a real problem, we quickly Kapton- and conductive- taped over these components, and found the emissions dropped significantly. This justified the hypothesis sufficiently to merit a later board revision and commensurate slight housing change to allow room for these components to be on the bottom side. With the layout change, we also added exposed copper on the periphery of the underside of the board, with a conductive paste, to implement an RF seal, and thereby Faraday cage, when the board is mounted to its enclosure. These changes, once implemented, sufficiently reduced the radiation coming from the board. Before we turned a new board, though, we wanted to also eliminate the conductive emissions, which were radiating off of the products internal wiring harness (and likely, further radiating off of the vehicle’s harness, though we could not verify this, as we did not have a tactical vehicle to work with). We found do-not-populate empty component locations on the board, which were put there specifically by the previous designer (kudos to him/her), in case conducted emissions problems were found. We populated these (and dead-bugged some proposed power protection on), iterated a bit with different values, until we were confident enough with conducted/radiated emissions to finalize on these values and turn the boards. Luxonis isn’t purely like 3M in terms of RF Engineering (we don’t just make your products better), we can also make the products to start with (and then you won’t need us to fix them). Our experience ranges from RF direction finding (DF) systems (end-to-end, from antennas to RF circuitry, to embedded system, to display on a smartphone) to active RF noise cancellation (similarly the whole system), to wide-band multi-channel magnitude/phase control (including high-power), to an RF up-down converter, specifically a multi-stage with extremely tight spurious emissions as it was being used with an extremely-high-directivity phased array. In the up-down converter case, we did not design the phased array; that was its own separate (and large) team. Below is a brief collage of some of these projects. Of particular challenge and interest was the up-down converter, and specifically, meeting all of the spurious emissions specifications across all operating up/down conversions settings. Below is a video taken manually-confirming (as a final double-check) all of our automated characterization. It is showing the board automatically step between all of its modes, while the spectrum analyzer shows the lack of spurs (notice the limits; the goal- and must-have limit separated by 6Db are horizontal on the screen, and all spectral power well below both).